Have you seen a Red Kite, a Kestrel or a Buzzard in SE or central Scotland? If so, please let us know! Submit your sightings online. You can also e-mail us your photographs, but please remember to include the 4 W's as set out below. 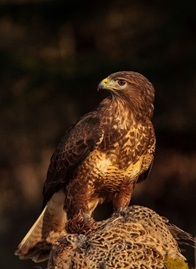 Birds of prey are top-predators, feeding on a range of different species. The presence of raptors is therefore usually an indicator of a healthy, functioning ecosystem. Raptors are also important motivation for tourism, and they are important contributors to the British economy. However, birds are sometimes involved in wildlife-conflicts with land managers, which can sometimes lead to persecution, illegal poisoning and shootings. On top of this, intensification of agricultural practices along with changes in land use have also contributed to a substantial decline of many birds of prey. We have chosen to focus on three raptors for this survey: Buzzard, Red Kite and Kestrel. Buzzards have undergone recent population recoveries, and are now regularly seen in the Lothian and Borders regions. 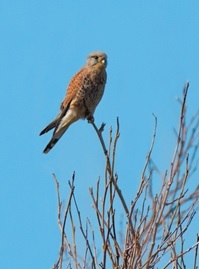 Kestrel numbers in contrast have recently been declining, but it is not known what is causing this decline. Red Kites are currently a rare sight in the Lothian and Borders area. However, they are found in other parts of Scotland and may start breeding in the region in the not too distant future. The Lothian and Borders Raptor Study Group have reported an increase in the number of sightings over the last 5 years (LBRSG Report 2013). 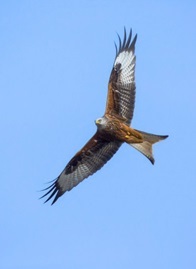 By asking everyone to look out for Red Kites, we increase the chances of spotting the birds if/ when they are around. This should help us better understand the existing distribution of kites in our region. By inviting everyone to get involved in this survey, we hope to encourage a greater appreciation of the raptors as well as generating many more records of the species, which will give us a clearer picture of the status of raptors in our region. We can thus monitor future changes to the populations and address potential declines before they become severe. What - we need to know what species you saw. If you are able to take a photograph of the bird, you can send it to us by e-mail on recordaraptor@wildlifeinformation.co.uk. We can then use your photograph to confirm your identification. When - please tell us when you saw the bird. Ideally this should be the date you saw the bird, however the year or even a time-interval (e.g. 'April 2013 - September 2013') is acceptable. Where - postcode, address or grid reference. Please be as detailed as possible on 'where' you saw the bird. Who - your full name and contact details (telephone or e-mail to confirm unusual sightings). Comments - any additional information on your sighting (optional). Tell us the status of the bird (alive/ dead), the behaviour (soaring, hovering, perching, feeding, etc. ), habitat (woodland, grassland, etc. ), wing tag (if so, what colour, on which wing and the number/-letter?) and if you heard or saw the bird. Since the start of the survey in May 2014 we have received almost 1500 raptor sightings for our region. Buzzards are the mostly commonly reported raptor, accounting for almost 70% of the record submissions so far. Kestrels records account for a quarter of all sightings and Red Kite c. 1.5%. We have also received a number of Sparrowhawk sightings - often observed in people's gardens. Please continue to send us your sightings and if you are in any doubt about what you have seen please e-mail us a photograph, so your record can be verified. Factsheets on the three raptors in our survey can be downloaded by following the links on the top left hand side of this page. TWIC will be sharing records from the Record a Raptor survey with appropriate organisations, including SOC (the Scottish Ornithologists' Club), the Lothian and Borders Raptor Study Group and Forestry Commission Scotland. The records have also been uploaded to the NBN Atlas Scotland at an appropriate resolution for public view. To become more involved in raptor-monitoring in the Lothians and Borders, please refer to the Edinburgh Hawkwatch or contact the Lothian and Borders Raptor Study Group. N.B. If you witness a suspected wildlife crime taking place, call 999 immediately. For any other wildlife crime sightings, contact your local police department. The 'Record a Raptor' survey is grant funded by Scottish Natural Heritage and Forestry Commission Scotland. All photographs owned by Dean Bricknell Photography (www.deanbricknellphotography.com).